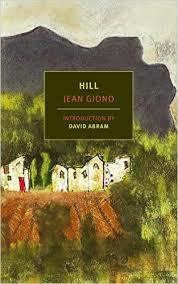 In encouraging readers to join a group read of French writer Jean Giono’s first published novel, his 1928 Hill (Colline), I may have been disingenuous in pointing to the novel’s mere 100 pages. There’s a terrible lot jammed into this small package, and while Giono’s story rips along at a compelling pace, what it leaves behind merits no small amount of attention and reflection. The tale of a small village confronting a series of calamities mysteriously connected with the impending death of its half-crazed eldest resident, Hill moves fluidly between granular particulars of place to grand global questions, an unorthodox, powerful exploration of the elemental forces with which people must reckon in trying to survive and of their responsibility towards life in all its myriad manifestations, all carried off with a close attention to language’s ability to construct a world – or to poison one. For the inhabitants of Les Bastides Blanches, an isolated hamlet (“un débris de hameau” in the original French) in the Alpes-de-Haute-Provence region of southeastern France, life, though not without hardship, seems to proceed more or less according to routine. “Things were going well…[the hill] had never said or done anything to harm us. It was a good hill. It knew pleasant songs. It hummed like a big wasp. It let us have our way with it.” The agglomeration sits between Lure, a menacing “reef” of a mountain that blocks off the west, and the inhabited plain far below. Giono’s first line provides an almost cinematic establishing shot: “Four houses, orchids flowering up to the eaves, emerge from a dense stand of grain.” From here, the narrative unfurls by adding in details here and there the way a sketch artist might, discrete glimpses that accumulate to deepen the reader’s familiarity with character and place. Giono introduces his characters all in a heap, almost a cast list, a dozen peasant farmers who view outsiders, even the postman, with as much welcome as they do the ill wind that scours the land. There’s Gondran and Marguerite and her father Janet; Aphrodis Arbaud, his wife Babette and their two young girls; Alexandre Jaume and his daughter Ulalie; César Maurras, his mother and a farmhand. Gagou, a simpleton who showed up three years previously, inhabits a makeshift shelter on the edge of the village, and ups the population to unlucky number thirteen. A few characters in this introductory list are supplied mere social labels: “their young welfare worker” “one from Pertuis;” “his father-in-law.” This last is Janet, identified by name in the French original a good three pages later such that he seems someone to overlook, with no hint of the central role he’ll play in the events about to engulf Les Bastides Blanches. But now there is a perturbation in the village’s way of life. The elder Janet is dying, and as he heads not at all gently into that good night, a disturbing anxiety takes hold of the village, accompanied by alarming events, especially the abrupt drying up of the village spring and, later, a forest fire. Out of an amalgam of practicality and superstition, a reliance on tradition and a grasping in desperation, the villagers seek Janet’s counsel, only to be rebuffed by his misanthropic ravings. This striking, commanding character embodies numerous dualities. He hovers between life and death, an indeterminate being lodged between flesh and wood, as Giono repeatedly tags him with metaphorical language relating to wood and trees: “hard like a laurel trunk;” “like a wooden saint;” “Janet is dead wood.” He occupies a place of great authority in the village, the repository of folk wisdom such as how to divine water sources, but also exudes a repellent maliciousness. His language alternates between nonsensical rants – about snakes emerging from his fingers, a giant anthropomorphized toad, accounts of his louche sexual histories - and an authoritative certainly about the world that is disconcerting to the others, especially to Jaume, the next most knowledgeable resident, who comes to a conviction that the troubles of Les Bastides Blanches all emanate, as though through a maleficent supernatural force, from Janet. To recognize in Hill elemental natural powers at work, framed by the primal conflicts and drama one might find in a Greek tragedy, readers also need not know that Giono’s novel is the first in a trilogy centered around the pagan figure of Pan, nor that as an adolescent the writer steeped himself in Sophocles, Homer, Virgil, Aristophanes and other classical writers (editions of their works cost less than the contemporary novels he’d wanted to read). Such influences seem to have left a dense residue in Giono’s own writing without his having to bludgeon readers with explicit allusions and references. And with his limited number of characters, cleanly exposed conflicts and a plot that unfolds like the acts of a play, Giono seems to evoke the Greek stage. For the most part, these action takes place in and around a “small square of bare ground” enclosed by the houses of Les Bastides Blanches. Even some of the interior action is glimpsed from outside, through a window, as though we are looking at a stage set. The language in Hill is immediately striking, even in a visual sense. The book’s pages consist of brief sentences, many of which stand alone as paragraphs, such that the text resembles something between verse and prose (one such paragraph consists of the remarkably communicative and encompassing single word, “Siesta”). Giono weaves into these brief sentences a vivid lyricism, filled with alliteration and rhyme, seeming at times to imitate psalmody, as though to echo Biblical narrative. Yet the world of Hill is largely a pagan one, and Giono almost completely avoids recourse to the Christian imagery that pervades, for example, Charles-Ferdinand Ramuz, a contemporary who also sensitively depicted rural people in collision with disaster. Probably the most resonant Christian image in Hill is a scene, more profane than sacred, in which Janet’s head lolls lifelessly on Jaume’s shoulder as in a lugubrious painting of Christ’s descent from the cross (certainly an abrupt contrast to the spellbindingly mystical and sacrificial scene surrounding one other human death featured in the novel that stresses finality and the absence of redemption). Frequently Giono anthropomorphizes natural objects and animals, or allows a bleeding between the natural and human, the animate and inanimate. Nearly everything is invested with life, as though the entire landscape, human and natural, is made of the same organic, living stuff. The houses resemble the people, with vines like moustaches. The stream runs by “with a furtive step…its little white feet on tip-toe.” The terrain is filled with “unnamed passes where there are rocks that have the faces of half-formed men.” Giono’s use of this anthropomorphizing, synthesizing, metaphorical language reaches its apotheosis in his riveting description - occupying nearly a fifth of the novel - of the apocalyptic forest fire that threatens the village. The fire is alive. The sky is blue from horizon to horizon. The silhouette of the grasses is distinct, and you can make out every shade of green in the patchwork of fields. Here the wind has dropped an olive leaf on a spray of borage; there the lamb’s lettuce stands out lighter than the chicory; and there in here in this corner, where somebody must have shaken out some bags of fertilizer, really dense grasses, almost black, are shooting up like thick hairs on a mole. And you could count the needles at the tops of the pines. I’ll also say something about Giono’s French, while acknowledging that the translation by Paul Eprile, which I also read, seems nearly miraculous given the particularities of Giono’s language. 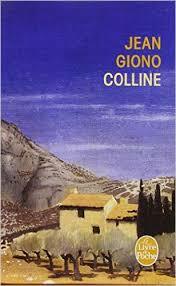 In addition to managing a highly lyrical descriptive prose despite the economy of his sentences, Giono also employs a distinctive, exquisite French infused with archaic or underused vocabulary; injects into his narrative words from Provençal (i.e. “topette” for a pitcher holding olive oil or “vièdaze” as a term of insult); and even “Frankensteins” French words with those from local dialect to create neologisms. He’s caused flesh and blood to suffer, flesh just like his own. So that’s the way it is – is he killing all the time? Is he living like a gigantic, runaway barrel, leveling everything in his path? Everything: animals, plants, and who knows, maybe even the stones, too. So, he can’t even lift a finger anymore, without unleashing streams of pain? …The idea rises in him like a storm. The whole passage seems weighted with an acute consciousness of the capacity of human beings to destroy, of cataclysmic forces that can be easily awakened, of the exceptional vulnerability and fragility of the world. One can hardly read of this “gigantic, runaway barrel, leveling everything” without considering another biographical detail: the author’s World War I experiences, which left him as one of 11 members of his brigade to survive the terrible battle of Verdun, and two years later, back in the trenches, with an injury from mustard gas. The war isn’t directly referenced in Hill, set almost timelessly in a vaguely late 19th century period, but the forcefulness of Giono’s response to destruction, the sheer scale of the powers that Gondran and the others see before them at last, suggests a writer himself shocked to the marrow by what he has experienced and layering into his narrative a sublimate of his reaction to the war (though it’s perilous to make such causal links, this one seems borne out by Giono’s life-long adoption of pacifism, which would embroil him in accusations of collaboration when the next runaway World War leveled everything in its path). Who writes about such things? An earth, alive down to its roots and rocks; a hill, as menacing and capable of blind malice as a monster in a horror flick; a wild, pagan and animistic universe, full - even within one’s own self - of the potential for violence and destruction? Of the repository of traditional wisdom – embodied here in Janet – having come unglued, and even flat out refusing to be of any help? Certainly those more well-versed in French literature could set Giono in a firmer literary context, but on this, my fourth outing with him, he seems an especially forceful and utterly singular writer. And then it was that he started to talk, as if he himself has been the source of the mystery. It all took shape – a whole world being born out of his words. He conjured up countries, hills, rivers, trees, wild animals. It was like his words were marching ahead, stirring up all the dust of the world. Everything was dancing and spinning like a wheel. It totally dazed me. In a glance, I saw, as plain as day, how all earths and heavens are one. Including this earth where we exist - but transformed, totally varnished, totally oiled, totally slippery with malice and evil…the words he sowed go on multiplying like weeds. Hill thus comes across not just as a lyrical and powerful small novel, but as a deliberate and self-evident affirmation that language matters, that in it one has the ability to construct or decimate a world. Before leaving off this interminably growing post, I’ll briefly note two other aspects of the novel. The first - since a question about narration prompted this group read proposal in the first place - concerns the novel’s narrator. Hill’s omniscient narrator remains for the most part outside of the action, yet in one instance one finds the pronoun “we” and in another “I.” Giono provides us few if any clues as to who may be telling the story, but with this subtle injection of first person pronouns he brings the reader directly into the tiny community of Les Bastides Blanches, invests him or her in its survival, “bound together” with its inhabitants “right to the bitter end…” The other aspect is covered by David Abrams’ introduction to the New York Review Books edition, which stands out for framing Giono’s novel in the context of contemporary environmental and ecological concerns and for what may prove the author’s increasing relevance. We have hundreds of 20th century writers who’ve testified to the horrors of war, but it’s difficult to think of another who has tried to dig so deeply to find the kernel of our violence and destruction, or who conveys so vividly and globally what stands to be lost by it: our only world, this one right under our feet, which “swarms with wild things.” “From now on,” says Jaume towards the novel’s end, “it’s going to be necessary to live in a lit-up world, and it’s painful.” We can nonetheless be grateful to Giono - a writer I certainly anticipate reading again - for helping to light it up. I'm happy to announce two upcoming group reading events and hope that others will join in for one or both. First, in the final week of May, Dorian of the Eiger, Mönch and Jungfrau blog and I will co-host a group read of Jean Giono's short novel, Hill (or Colline, for those of you who might want to read it in the original French). I've been eager to return to Giono, and thus jumped at Dorian's suggestion that we read this together. Hill has just been issued in English translation by New York Review Books, and as it's only about 100 pages long, you know you can read it by the week of May 24-31, when we'll start posting commentaries. 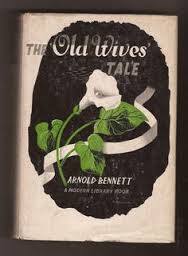 Second, and also stemming from a suggestion by Dorian late last year that followed on my year-end appreciation of two Arnold Bennet novels I'd read, we will take up Bennett's best-known work, The Old Wives' Tale, in late July. This one's some 600 pages longer than Hill, but if it's anything like the Bennett books I read last year, it promises to be a highly amusing ride. We'll announce a specific date as we get closer to July. If you're interested in joining for either or both of these group reads, please let us know! It’s a wonder that I even read Love in Vain, a collection of short stories by Sienese writer Federigo Tozzi (1883-1920), as everything about the book - starting with the discouraging title and lugubrious cover - seems almost deliberately primed to bring the reader down. The table of contents too reveals several more dismal titles, like “To Dream of Death” and “Vile Creatures.” Going into the text itself, one finds more than a few leaden, dramatic pronouncements like the one I’ve used in the title of this post. And to top it all off, the tales by this devotee of Gabriele D’Annunzio explore a similar fascination with decadence and with the intersection between love and death, with subjects that promise a wallow through human misery. Indeed, Tozzi’s stories are filled with stunted hopes, failed love affairs, economic insecurities, and repressed, simmering anger that occasionally erupts with grievous consequences. Characters in not a few of the stories come to bad ends, including suicide, murder and cruel accidents, as in “Dead Man in the Oven,” in which a vagabond accustomed to sleeping in an unused oven neglects to realize one night that the baker has put the oven to use that day, with consequences evident from the story’s title. With all this cheerfulness in the offing, one could hardly be faulted for harboring low expectations, but Tozzi’s stories defy pigeon-holing. The occasional infusion of Christian mysticism in these tales; their palpable, evident excitement in exploring the new field of psychology; and their singular style and careful construction seem nearly incongruent with their dark themes, revealing a writer certainly as devoted to the art of the short story as to reveling in the obscure mechanisms of human behavior. 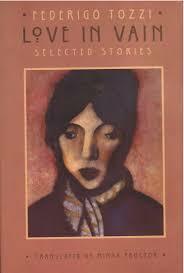 Love in Vain is one of the finest short story collections I've read in a long time. The 20 tales included in the volume - all from between 1908 and 1919, twelve years of productivity cut short by the influenza epidemic in 1920 - range across numerous subjects, linked by an astute psychological realism and portraits of passionate persons engaged either in succumbing to or surmounting their emotions. The zeal with which Tozzi approaches psychology is obvious in stories like “Mad for Music,” in which the narrator explicitly announces that “Through the observation of the typical characters you might come across, especially on the streets of small cities or towns, you can greatly enrich your understanding of life,” and then proceeds to assert the need to study especially those who, “by the grace of fate’s outrageous excesses – manage to set themselves apart from social norms.” The story concerns a young man, Roberto Falchi, who, following a case of meningitis, loses “all trace of intelligence,” but, as in an Oliver Sacks case study, becomes obsessed with music and convinced he is a great musician. In “Vile Creatures,” an unnamed observer in a brothel eavesdrops on the talk between five of the girls during an idle moment, as they trade stories of their tragic pasts and dreary present, their hopes (or lack thereof) for the future. In “Poverty,” the narrator rests his tale squarely on the emotional instabilities caused by money worries in the relationship between a poor accountant and his wife and stepmother. “House for Sale” depicts an extreme case of submission and self-abasement when a property owner is cowed by unscrupulous buyers into letting his home go for next to nothing. In “The Boardinghouse,” the relationship between two elderly neighbors who over the years share small talk in the hallway between their rooms but otherwise fail to connect is revealed as an intractable and terrible dependence when one of them sickens and dies. A similar social distance appears in “First Love,” perhaps the tale most indicative of Tozzi’s modus operandi. Over a mere six pages, the affection of two schoolchildren for one another is tested over several ensuing years; readers expecting from the title something heartwarming will be disappointed to find instead a tale of young people attracted and ultimately repelled by timidity, jealously, and the boy’s immature fits of pique, leaving the characters at a greater distance than they were at the story’s beginning. I thought: a world of God’s creation is left unfinished. Its matter is not alive, not dead. The vegetation is all identical in this world, and the rough sketches of formless beasts are unable to move out from their muck because they have neither legs nor eyes. The plans in this world cannot be distinguished by their color – because they have none. This world would also have its own odor – but only when spring is approaching; and so it’s a rather muddy smell. Adam is there, too – a rough version of him – he has no spirit, no soul. He cannot talk or see, but he feels the mire around him moving, and it frightens him. There is neither a sun nor a moon. This world lies in the loneliest corner of infinity, where there are no stars, where a lone comet goes to die, as if in exile. This half-life is more ancient than our own. This peculiar flight of imagination offers no hint that the story will actually turn on the fate of a wretched, abused girl of the streets as well as on the narrator’s conflicting desires both to protect and rescue her from such a terrible state and to avoid being seen as just another abuser. “The Idiot” is an even more imaginative effort, in which Tozzi attempts to relay the inner thoughts of a retarded child. This might in itself have been a novel experiment for someone writing at beginning of the 20th century, but Tozzi complicates the idea further by having the child relay his thoughts through transference via an imaginary conversation between the King of Spades and Queen of Hearts, playing cards the child finds in the yard, dampened by rain. The contrast between the violent extremes of thought that run through the child’s head and the placid, drooling face the rest of the world sees is dramatic. And in “The Clocks,” a tale that seems part-Poe, part-Ionesco, the death of a collector of clocks is accompanied by the clocks’ slowing down and stopping, one by one. Frenchie asked Sara, “What are you reading? “So-so,” answered Sara, careful not to reveal how she felt about the book. Translator Minna Proctor’s informative introduction suggests that Tozzi, though long admired by his followers such as Alberto Moravia, is only beginning to receive more widespread recognition as one of Italy’s great modern short story writers. In addition to 120 short stories, he wrote five novels as well as poetry, plays and essays, though is perhaps best known in Italy for Novale, a collection of Tozzi’s correspondence with his life-long partner Emma Palagi, collected by her after his death and supplied its curious title, a neologism, by Luigi Pirandello. And while a few of his novels have been translated into English, Love in Vain appears to be the only collection of stories available so far. It’s a pity, since Tozzi’s stories possess a freshness and contemporaneity that make them seem as though they could have been written recently, rather than 100 years ago – models of the kind of limited scope, minimalist, restrained slices of slightly distorted life to which so many writers today aspire. And in the end the tales may not be as dark as they at first seem. When in “A Miracle” the bookish main character convinces himself that “with delicious certainty, deep inside, he was a child,” we’re treated to a kind of benign lunacy, a man who revels in watching water, envisioning creatures dancing along the wind-blown grain, and in hugging trees – a solipsistic madness, true, but an affirming one.